The third reason I was up at the Cottage Lot this Past weekend was to meet with the engineer who will be providing the engineering report for the septic system that I require to get the building permit. Background: The province (Quebec) put in new legislation about a year or two ago requiring a formal engineering report to establish the requirements for a septic system in order to get a building permit. I know this to be a change because four years ago in my previous but aborted attempt to build the cottage I was able to get the permit without the engineering report. 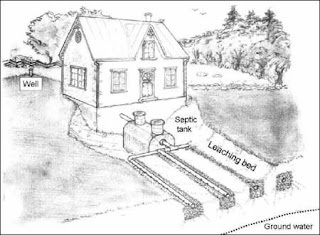 The engineering report specifies what kind of septic system, size and allowed location - this is all based on the expected use of the cottage to be built - generally determined by the number of bedrooms (a proxy for the number of people using the cottage). Peter Macintosh, the engineer, arrived about five minutes after Doug Zacharias, the foundation contractor (see previous post), so it took some juggling. After another round of introductions and chatting among the three of us, I first dealt with Doug and them Peter. Peter's adult son came to assist him. So as Doug and I were discussing the foundation quote, the two set out to do their measurements. Fortunately all the lot markers are visible, and had marked out approximately where the cottage was to go, so Peter was able to quickly assess the location. I was surprised but very pleased that Peter determined that there is enough space for a complete septic system, tank and bed. He also indicated the best location for the well if I choose to put one in (I currently draw water from the lake). In about half an hour Peter and team were done. He indicated the report would be completed next week (this week) and he would send a copy to Rick, the building inspector in Otter Lake. NEXT: I discuss a neat way to store the furniture that is eventually destined for the cottage.